Prince William and Prince Harry seen having fun at the Star Wars premiere in London! Star Wars: The Last Jedi is one of the most anticipated movie of the year, has already created a havock and it hasn’t even out yet. It debuted on Rotten Tomatoes with the highest-ever score for a Star Wars movie, rating 96 per cent or 8.3/10 on average from about 92 reviews. Prince Harry and Prince William were the ones who turned heads at the UK Premiere as they graced the red carpet with their presence. They were seen posing with the Stormtroopers and driod BB-8. The red carpet was also attended by Star Wars favourites C3PO and R2D2. The royal heirs are said to have made a cameo appearance in the movie. Dressed as Stormtroopers, Will and Harry are reportedly giving Benicio Del Toro a slap on the backside in the uncredited roles. They are said to be a in a scene where Rey and Finn infiltrate a secret base. The rebel characters are in a lift with Benicio Del Toro’s character when a group of Stormtroopers enter and the two of them are William and Harry. Harry and Will were joined by Daisy Ridley, Adam Driver and Mark Hamill at the premiere in London. 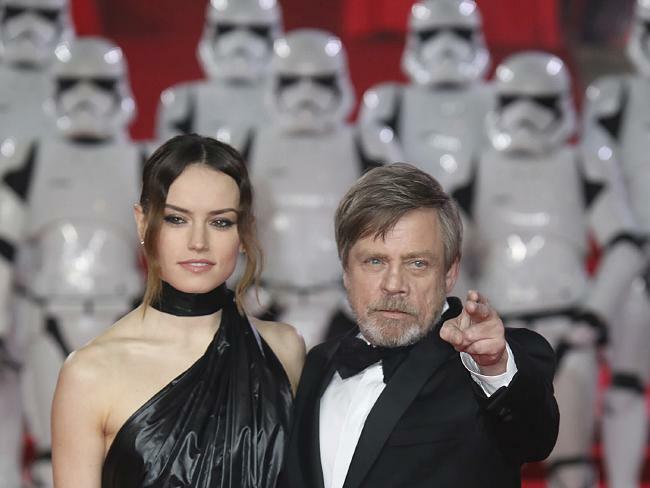 Ridley, who plays Jedi Rey in the latest Star Wars instalment, sported a black Calvin Klein dress with an asymmetric neckline as she posed with co-star Hammil, who plays Luke Skywalker.